I've been thinking a lot lately about why it never seems like any amount of vacation or down time ever seems to be enough. I suppose there could be a lot of reasons for that. I'm burned out. I don't get good quality sleep. I spend much of my time off running around making up for the things I didn't do because I was busy before. All of those are good reasons, but I've discovered another one recently. And it's that the time that does get spent as downtime is time I feel guilty about. Guilty, because there's always something else I could be doing. There's always something left on my to-do list. And so when I truly do nothing, my head is filled with thoughts of how much more productive I *could* be. I just don't let myself savor it. Does this sound familiar to you? Don't get me wrong. I have plenty of down time. More than most people because I don't commute to a job and don't necessarily work a full day every day. But little of it is quality time. Either I'm multi-tasking, such as watching TV and picking stuff up around the house. Or I'm laying here comatose, unwilling to do anything else and beating myself up about it because of all the stuff I COULD be doing but am not. The only time I ever seem to be in the moment and relaxed and enjoying my downtime is when I sit outside and meditate at night. And even then my mind wanders sometimes. So there are two things going goofy here. One is feeling guilty about doing nothing. And the other is is overstimulation/multitasking/worries that take me out of the moment, effectively voiding the effects of downtime. Too often I think we think of rest and relaxation the same way we do dessert...if and when you have it, you have it after everything else is eaten. And sometimes you don't eat it. It's an indulgence. A treat. When did this become OK? Why did I let it be OK? And was it ever any different? Truth is, I'm pretty sure we weren't sent down here to work all the time. And what logic does it make that downtime and relaxation...recharging....would be a last resort—something to do only when everything else is done? 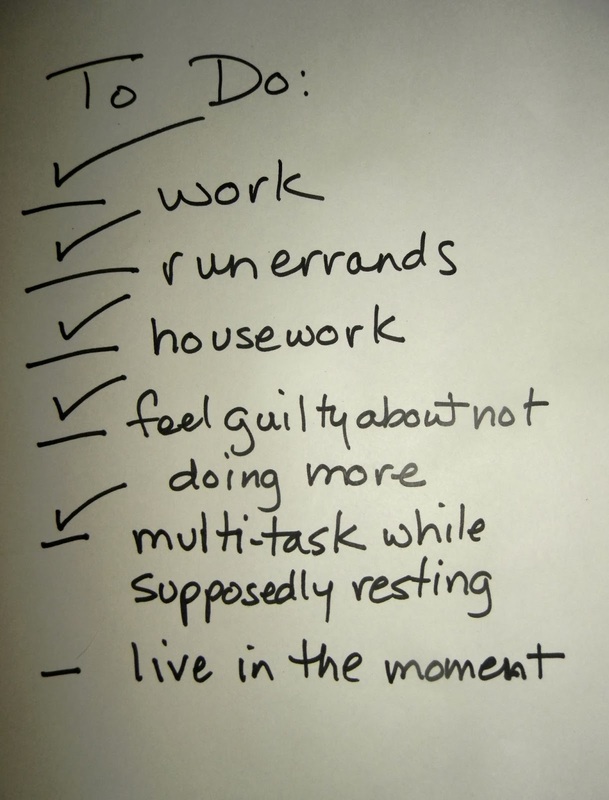 How come rest and enjoyment never even makes it to the To Do list, much less rises to the top of it? Why doesn't life work the other way around, meaning that when we're busying ourselves with work and errands and little tasks we're not feeling guilty about not relaxing more? If not now, when do we become fully present and aware in the time that's the fruit of all our toil? I like feeling busy and accomplished a lot as much as the next guy. And it would be wonderful to have absolutely nothing left on that To Do list. But I'm not sure that will ever happen. So if I have to "earn my way" to relaxation by doing it only after everything else is done, I'll never have fun! And I'd like to feel just as accomplished and productive from doing nothing as I am from doing lots of crap. After all, downtime recharges us, it reduces stress (which improves health), it allows us to pursue our diverse interests and it makes life more worthwhile. Shouldn't that be a star on the To Do list, along with "make money" and "clean house"? Maybe I'm alone in this. But I don't think I'm alone at not being fully present and in the moment in life. That alone—whether being present in work or play—makes us more vital. So what's your story? Do you enjoy guilt-free, fully present down time? Or are you doing it all wrong just like me? At 50 I'm thinking more and more about what all of this is for and I'm pretty sure it's not to live from one busy weekend to the next.